"Every day is an adventure if we only know where to look," says today's guest writer, Kate—an illustrator and writer who shares her life after loss at Adventures of a Grieving Mother. I’m sitting in an exam room in a hospital gown, a cold draft from the ventilation system running up my back. The doctor breezes in and immediately starts to talk, to show me she has read my file and she knows my history though we have only just met. A year ago, a doctor trying to make clumsy attempts to connect with my story would have sent me into paroxysms of tears. But today, instead of crying, I start thinking about how I’m going to draw her. Do I emphasize her black hair floating down her back in contrast to the stark white lab coat? Do I draw her lab coat, or is that too cliché? I notice her long fingers and the way she crosses her legs. She leans against the counter, telling me about her friends and their newborn who has a heart condition. To her, their strife is exactly like the loss of my son. Both were infants, I guess. It takes too much energy to puzzle out the connection. I listen not because her empathy resonates, but because it is darkly funny. I want to remember the essence of this experience to capture it as a cartoon. I’ve spent a lot of time in the driver seat of my car, tears leaking down my face in a downpour too furious to drive through. But today, when I get out to the car, I pull a sheet of paper from my bag and start to sketch, noting down the rough outlines of dialogue. I sketch out a six-panel frame with the sequence of yet another failed doctor’s appointment. As the art emerges, I begin to understand she was trying to build a framework of words in which we could relate. Even though it failed, after turning the situation over in my mind, and with my pens, a light bulb winks on above my head, cartoon style. She was trying her best. My son Nathaniel died. In the aftermath, my words dried up. I tried to write, to describe my feelings to friends and professionals. I failed to find just the right words to capture the experience. Joy and pain, love and grief. Strength without source. Courage, often, but not always. My husband and I could communicate these complicated feelings with a touch, a look. We didn’t need words. But the external world needed an explanation, I felt it was owed. I would stare at the blank page remembering what it was like to stare over my swollen belly at the array of nurses and doctors, the blinding lights, the cascading pain of the final push that brought Nathaniel into the world. I couldn’t describe it, but I could see it. So, I took my pencil and changed my grip. Instead of holding it for control near the end for the precise formation of letters into words, I loosened and lengthened my hold to the middle. I could make fluid lines and short cross hatching strokes. I drew the chaotic cascading spray of the first shower, supported by nurses making jokes about horror movies as the blood ran down my legs and circled the drain. We didn’t know yet. I drew the ambulance ride and the screams of healthy babies on the ward as we waited to visit our baby, silent and sedated in the NICU. My pencil recreated the first day home, the nursery that loomed in the corner, full and silent, but so empty. I didn’t have to tell it. I could show it in simple black and white. As I remembered each scene and examined it critically for the best way to convey the feeling and sequence, I became almost an outside observer. Filtering our story through the lens of design provided distance that allowed for reflection. My drawings weren’t perfect, but they were real and they were mine. Slowly my lines grew sure and faces became dimensional. Gradually the tears stopped christening every single page. I captured our story and the day to day life as we emerged from our grief and started to try again to expand our family. As we navigated the label 'infertile' and the appointments and clinical tests that came with it and the aftermath of failure. Cartoons became the perfect medium to capture the horrifically comical scenes that take place in a doctor’s office or the grocery store line. I’m walking through a golden carpet of leaves in the woods with a dear friend. Her dogs jump in and out of the stream, snapping at scarlet maple leaves as they gently float by. Our hands are warmed by hot tea, the scent of honey and lavender rising up to mix with the earthly smell of leaves slowly becoming forest loam. In a clearing she turns to me, eyes brimming and tells me she is pregnant. Our tears mingle as I press my wet cheek to hers, squeezing my love, anxiety, happiness and sadness to her. They all swirl inside as they have for the last two years whenever a close friend has told me their good news. It happened a lot in the year after Nathaniel died, and the news would send me into a grey, teary stupor days. Why not us? Why couldn’t our beautiful, perfect boy live? The care with which my friend had given me her news shows the depth of love in our friendship. The fact that I could simultaneously hold joy and sadness without the sadness coming out on top shows the work of healing. After our walk, I drove home recalling the words of another herbalist friend, the lingering scent of lavender tea providing inspiration. Herbs are there when we need just a little extra support. What allies would I call on for a broken heart? I got out a pen and began to sketch. Lavender, of course. Lemon balm to sooth the restlessness. I dug up my grandfather’s herbal. Skullcap was used in Native American preparations to support a woman’s reproductive system and in western herbal medicine for anxiety. The dualism of this use resonates with the sadness and hope we have trying to conceive. I use the pencil to sketch the tall spired flower stalk of skullcap along the side of the page, mirroring the lavender, with a skirt of violets and lemon balm along the bottom. As the page fills with each new plant and I think about how they have been incorporated into healing preparations for eons, the ache squeezing my own heart lessons. Though I haven’t taken them internally, these herbs sooth me. They are allies through my sadness. I study their photographs to see how the leaves attach to the stems, the shape of the petals, the drape of the stalks to their form so I can recreate them on the page. The drawing for sadness done, I gather the herbs I’ve been using to support fertility: nettle, raspberry leaf, and red clover in a daily tea. Black cohosh in a supplement with other eastern herbs. I start to trace the lines of these plants, laying them out along the page. Drawing becomes a form of meditation and reflection. It allows me to enter a place of concentrated focus so that my worry and sadness get laid aside for a short time. I breathe and relax so my lines stretch out and get loose. Later, I may turn our moment in the woods into a cartoon. It was tender and beautiful and raw, the perfect mix to apply to art. 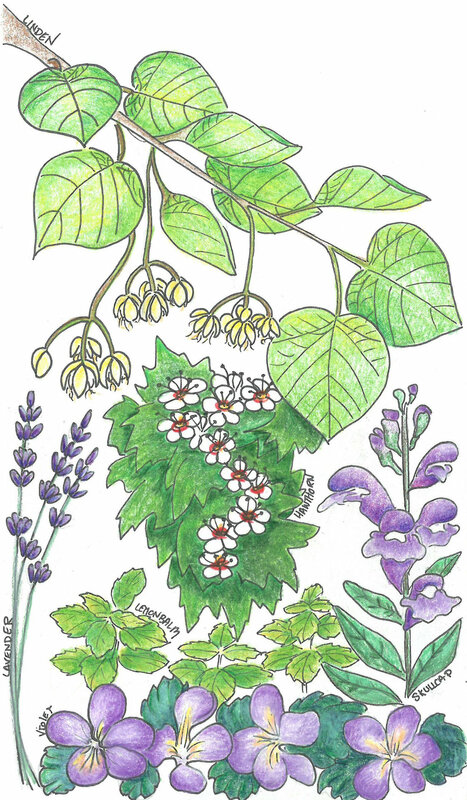 The herbs support my body while the drawing soothes and nourishes my mind. Healing is a path, not a destination. I still cry at odd moments in my car, but those moments are fewer. My doctor still pulls out the story of her friend’s child with the heart defect and I nod and smile and remind her gently that I don’t care. Her friends anxiety is not my grief. I rarely cry when I draw, and I draw all the time. My art resonates with other women and they reach out to tell me about their moments that were so much like mine. We create a shared narrative as we tell each other about our complex feelings and slowly the words start to return. The blank pages get filled. We may never bring another child into this world. I’m learning to be ok with that. I bring art into the world instead. Have words failed you? Have you found expression, reconciliation, or peace in other creative or unexpected ways?